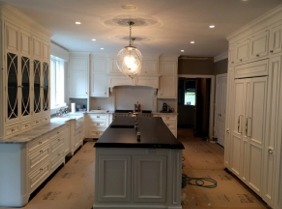 DXL Construction offers quality Kitchen Design Services for homeowners in Fairfield County, CT. As a homeowner, performing a kitchen upgrade can be one of the greatest home improvement investments you can make. It will not only create additional comfort and functionality to your home, it will also increase it’s market value and make it much more attractive to potential buyers when the time comes to sell. The home improvement professionals at DXL Construction understand that kitchen remodeling requires a great deal of design planning in order to make the most of the layout and configurations of your space. DXL Construction will assist you in choosing the best possible options for use, including cabinet space, flooring, and the installation of modern appliances and fixtures. Contact us online or call us today at (203) 482-1692 for a free initial consultation.